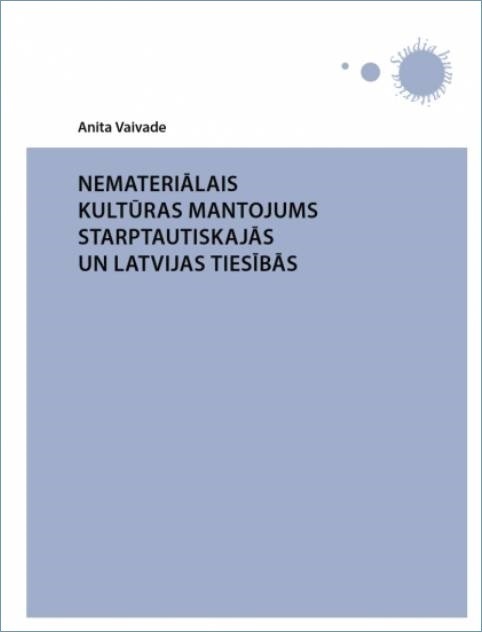 "Intangible Cultural Heritage in International and Latvian Law is an original research that reaches into two branches of scholarship. It belongs to the studies of law, touching the history, philosophy, semiotics and language of law. At the same time the monograph also contributes to the theory of culture, as the subject chosen for it is the international cultural policy, more specifically UNESCO Convention for the Safeguarding of the Intangible Cultural Heritage. The interdisciplinarity of the work is related to its purpose – to study the international and local practice of legal framework in the field of culture. The author of this work has succeeded in creating a truly integrated view, which is not just a superficial matching of two fields, but indeed a well-grounded and critical analysis of the interaction of culture and law." "The monograph is a valuable scholarly study, theoretically innovative and with a perspective of practical application from the perspective of law. The author presents a well-founded view of inter-relationship of international and national law, and the conclusions and proposals resulting from such scholarly approach are highly valuable and applicable in creation of legal practice, as well as the academic (study) work. The research views law as a precondition of safeguarding the cultural heritage. The history of formation of the concept "intangible cultural heritage" deserves special attention – for the first time in Latvia’s legal literature the development of international law in the field of safeguarding the cultural heritage has been traced in detail and in historical succession." The book was prepared and published with the support of the Republic of Latvia Ministry of Education and Science budget sub-programme No. 05.04.00 "Krišjāņa Barona Dainu skapis" (The Cabinet of Folksongs of Krišjānis Barons) and the State Culture Capital Foundation.